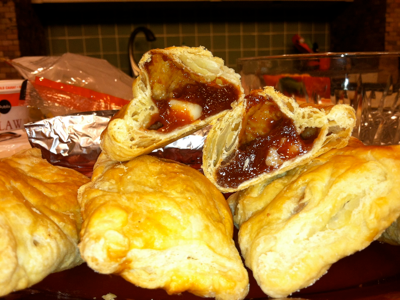 When I go to South Florida, I just can’t get enough of these pastelitos de guayaba; Cuban guava pastries. There is a place in Little Havana in Miami that makes these and the long trip down to Calle Ocho in Miami is worth it when I bite into one! Since I can’t just pop on down to Miami anytime that I want; I asked some of our Cuban friends to teach me to make these. Mary Rodriguez and Marilyn Rodriguez ( sweet friends of mine who are of no relation to each other!) taught me which guava paste was the best, (ironically, the most inexpensive!) and the art of cutting the pastry on the top; the cream cheese mixture and the extra bit of love in each one! Roll out each sheet of puff pastry and cut into four equal squares. In the center of each square, place the guava paste. In a separate bowl, mix together cream cheese and sugar. Dollop the cream cheese mixture (optional) on top of the guava paste. Fold the end of each square over filling and press to close with your fingers. Make three slits/openings down the center of each pastry with a knife. Place on a parchment lined cookie sheet. Make an egg wash with beaten egg and water, then brush on top of pastry. Sprinkle tops with sugar and bake for 30 to 35 minutes or until golden. Enjoy!